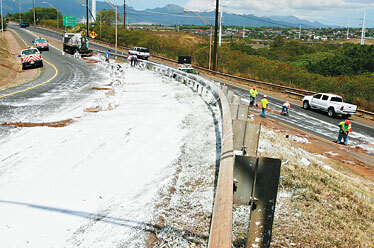 Many gallons of white paint spilled onto the Waipahu offramp on the westbound side of the H-1 freeway at 9:42 a.m. yesterday, forcing its closure. A 1979 International flatbed truck owned by Martin Warehousing and Distributors was on the offramp when its load shifted, spilling the paint. Department of Transportation and Fire Department crews cleaned up the mess.